Secondhand appliances in good condition save money on the kitchen makeover. Whether you're a foodie who whips up gourmet meals or a thrifty spender who cooks at home to save money, the kitchen is your domain. If your kitchen reminds you of your parents' home, inject your own sense of style with a remodel. Getting rid of an outdated kitchen often comes with a large price tag, but there are ways to spice up the kitchen without rivaling your student debt. Even updating a few features in the room can change the overall look for the better. Make over your kitchen in phases to spread out the cost. For example, you might repaint one month, replace the cabinetry the next and install new flooring the third month. 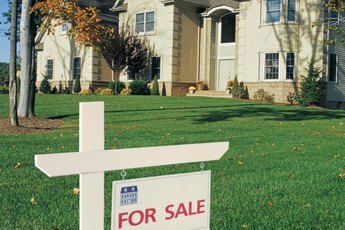 Projects may even span a year or two depending on your budget. Capitalize on your friends' talents for your kitchen remodel. Call on your design-savvy friends for a consultation on the kitchen updates. Ask a woodworking friend to build you a new kitchen island or cabinetry. Throw in a free meal on top of the cost of materials as payment. Look through the kitchen to figure out which parts you can reuse. For example, if the cabinets are still solid, you can update them without replacing them to save money. Reclaim forgotten kitchen furnishings at an architectural salvage yard, antique shops or secondhand stores. Use reclaimed wood floorboards, cabinets or tiles as your backsplash. Reclaimed home materials usually save money and give your kitchen character. Minimize your kitchen design to keep with a modern, sleek look while saving money. 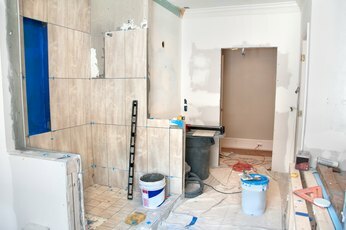 Forget about lots of knickknacks or wall decor, which just clutters up the space and adds to the remodeling costs. 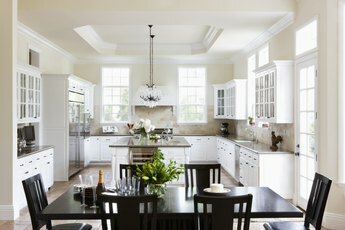 Spend your kitchen remodel budget on the functional features you need. You can always add more to the kitchen down the road. Paint the walls to give them a clean, fresh look. Choose a different color than you previously had on the walls to update the look. Add checkers, stripes or other faux painting techniques to dress up the walls even more. Replace the hardware on cupboards. Decorative handles change the look of the cupboards overall. A new coat of paint or a new color of stain is also an inexpensive way to change the cupboards. Ditch the upper cabinets and install open shelving. This option works well if your old cabinets are in rough shape but you don't have the money to replace them with new cabinetry. If you have to replace countertops, look for a more affordable laminate that looks like granite. 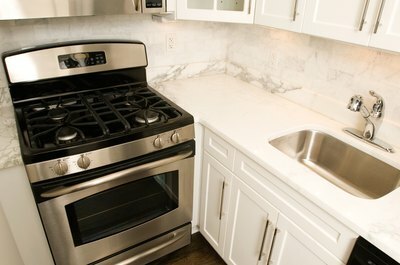 You get the look of granite at a much lower cost and less maintenance. Concrete is also something you can do yourself. Install vinyl floor tiles or laminate flooring if you need an updated floor. Both are affordable and easy enough for homeowners to install, saving you money on labor. Ceramic tile is also a more affordable option than higher end tiles or hardwood. Purchase used appliances if you can find them in like-new condition. Look for a used furniture store, check out auctions or look for private sellers and online. If you want to buy new appliances, look for floor models or last year's models on clearance. Roll up your sleeves and get dirty to save on labor costs. But always know when to bring an expert in. Unless you or someone you know has experience, things like plumbing and electrical are better left to professionals.